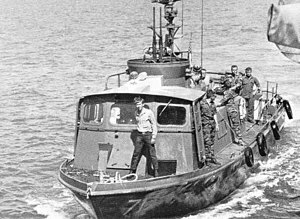 Swift Boat PCF-71 in Vietnam, showing forward twin .50 caliber (12.7 mm) machine guns directed upward in their secured position. May 21, 2018. About Me. It’s crazy of me to think that Jehovah God really made me the “lighthouse” to prevent the Mormon terrorists (and their cohorts) stationed in Langley and at the Pentagon from entering the harbor. Obviously I am insane.